source: Tahtheeb al-Ahkam 4/299 & Wasael al-Shia 10/457. source: Tahtheeb al-Ahkam 4/300 & Wasael al-Shia 10/457. source: Kitab al-Sawm by al-Khoei 2/305. ‘Ali bin al-Hassan from Muhammad bin ‘Abdullah bin Zurarah from Ahmad bin Muhammad bin abi Nasr from Abban bin ‘Uthman al-Ahmar from Kathir al-Niwa from abu Ja’afar (as): “On the day of ‘Ashura, Nuh (as) ordered all those with him on the ship, whether Jinn or Humans to Fast on this day, and abu Ja’afar (as) said: Do you know which day this is? this is the day which Allah forgave Adam and Eve (as), this is the day which Allah split the ocean for bani Israel and he drowned Pharaoh and his followers, this is the day when Musa (as) defeated Pharaoh, this is the day in which Ibrahim (as) was born, this is the day when Allah forgave Yunus (as), this is the day in which ‘Isa ibn Mariam (as) was born, this is the day when al-Qaem (Mahdi) shall rise. source: Tahtheeb al-Ahkam by al-Tusi 4/300. And with its Isnad to ‘Ali bin Faddal with his Isnad to abu Ja’afar (as): “On the day of ‘Ashura, Nuh (as) ordered all those with him on the ship, whether Jinn or Humans to Fast on this day, and abu Ja’afar (as) said: Do you know which day this is? this is the day which Allah forgave Adam and Eve (as), this is the day which Allah split the ocean for bani Israel and he drowned Pharaoh and his followers, this is the day when Musa (as) defeated Pharaoh, this is the day in which Ibrahim (as) was born, this is the day when Allah forgave Yunus (as), this is the day in which ‘Isa ibn Mariam (as) was born, this is the day when al-Qaem (Mahdi) shall rise. source: Mustadrak al-Wasael by al-Tabrasi 7/524. al-Saduq narrated: “On the tenth of Muharram and it is the day of ‘Ashoora, Allah forgave Adam (as), and in it the arc of Nuh (as) floated, and in it Musa (as) crossed the sea, and in it ‘Isa bin Mariam (as) was born, and in it Allah let Yunus (as) out from the belly of the whale, and in it Allah forgave the people of Yunus (as), and in it Dawood killed Jaloot, so he who fasts on this day Allah shall remove his sins from seventy years and will forgive him for all sins done in secret. source: al-Muqni’i by al-Saduq page 208. So now I ask the Shi’ites to apologise to Mu’awiyah (ra) since he was right and you were wrong and since he followed the Sunnah of the Prophet SAWS and you do not. Wahhabis celebrating Al-Hussein’s (رضوان الله عليه) death! `Āshūra (10th of Muḥarram): A Day of Joy or Grief? This entry was posted in Ashura & Muharram of the Karbalaites by Gift2Shias. Bookmark the permalink. So the meaning of combining these reports, is what our shaykh (rha) says, and if one fasts on the day of ‘Ashura on the intention of grieving the misfortunes of Aal Muhammad (‘as) and grief of their state, so then he hits (ie. he’s right). And one who fasts on then based on what our opponents think from the virtues and blessings of it, and believes in it’s blessings and happiness, so then he has sinned and erred. As I have posted on my shiachat account the same. Well, ya Rafidah, then fast on that day with a GOOD intention and don’t forget to stop by EACH Rafidi Marja’ and other Shia propagandists who claim that fasting on that day is an ‘Umayyad/Jewish’ invention. Well, it is not, not even according to Tusi. 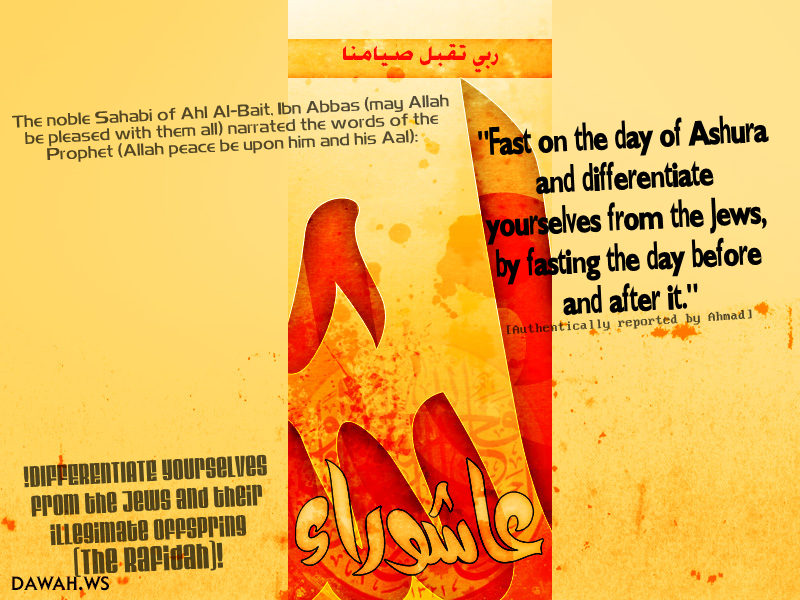 Anyway, we will soon release another article in sha Allah, proving that ALL the narrations that talk about fasting of Ashura being haraam/disliked are WEAK and those that state that fasting on that day is recommended are SAHIH. So Tusi was wrong (especially since the worship must be based on the sunnah of the Prophet, only an idiot – like tusi – can claim that fasting on Ashura with the intention of remembering Hussein is right whilst fasting on Ashura according to the TRUE Sunnah – which of course has nothing got to do with the martyrdom of Al-Hussein that happened AFTER the death of the Prophet – is wrong! ).